The twenty-first victim of a heinous bus bombing in Jerusalem in August, 2003, was Rachel Weitz, 70. Her name probably flew by most of you. It almost flew by me, too. My breath stopped as I ran to the phone book to check if there was any other Rachel Weitz in Jerusalem. There wasn’t. Rachel Weitz was my beloved mikva lady. When I was a young bride, we lived in Kiryat Moshe and the closest mikva was in Mattersdorf, a very Charedi neighborhood. I felt a little wary the first time I went there – in my sandals and flowing headscarf – but Rachel immediately made me feel welcome and cared for. Most of the women who came to Rachel’s mikva wore thick stockings and wigs or hats that covered all their hair. But once one walked through that door, we were bonded by our shared faith. So I continued to go there – even if it meant taking a bus or two. No matter where we lived, I loved returning to Rachel’s mikva. The atmosphere in Rachel’s mikva was one of acceptance, and kindness, no matter where you came from. For my entire married life, I measured every mikva lady I ever met by Rachel Weitz. Every time I entered her pristine structure, I felt like I was parting a veil and entering a sanctum. Sometimes the world outside was insane. War. Terror. Chaos. But it was always safe in Rachel’s mikva. There, I always felt at home. The women in Rachel’s mikva all read Psalms while they waited. For the people of Israel, or for their husbands and children. Or if they had no children, perhaps they were praying for themselves. 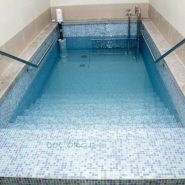 Whenever I stepped up and out of the mikva, Rachel would grasp my wet hand, while I was still on the last step, shake it warmly and give me a blessing for joy and good luck. And once she had seen me dunk, she would hold the towel up to hide her own eyes, protecting my modest dignity before I swathed myself in the soft, white terrycloth. In the years of our marriage, we’ve traveled, and I’ve been to luxurious mikvaot in London, New York and Beverly Hills. They had multi-colored tiles, carpeting, and coffee and cookies for post-immersion pampering. But none of them were ever as soothing to me as Rachel’s spartan mikva. Rachel’s blessings have accompanied me throughout my married life. She has been a role model to me of kindness, of cheerfulness, of what it means to make another person always feel comfortable, special and welcome. During those sad days, Israelis turned to each other for comfort and support, saying, “What unites us is greater than what divides us.” For some people to reach this conclusion, it took horrific deaths. For Rachel, this philosophy was a way of life. The last time I visited the Mattersdorf mikva, in 2002, they told me that Rachel had retired. But the spirit she had brought to the mikva was still there. I missed her. Well, I thought, someday I’ll go and visit her at her home, just to say hello. Someday I’ll bring her flowers. Someday I’ll call her and tell her what’s going on with my children. This righteous woman was slaughtered by a terrorist. This knowledge is hard for me to live with. And so is the knowledge that I never found the time to tell her, Thank you. *Toby Klein Greenwald would like to honor the memory of Rachela and Dov Kol, who were murdered by terrorists on Tzir Kissufim, leaving Gush Katif, in 2005. When Dov read the column “Rachel’s Blessings” by Toby, in 2003, about her beloved mikva attendant, he said to her, “Someday you must write a play about this lady.” May their memories be for a blessing. I saw Mikva the Musical and LOVED it!!! I feel they do a tremendous service to Jewish women by presenting so many different faces of the mikva experience. I highly recommend it – it was both hilarious and thought-provoking! !